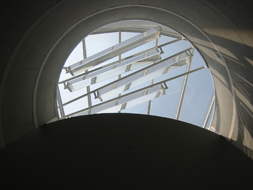 In architecture a lightwell, light well or air shaft is an unroofed external space provided within the volume of a large building to allow light and air to reach what would otherwise be dark or unventilated area. Lightwells may be lined with glazed bricks to increase the reflection of sunlight within the space. In music, Lightwell is the newest manifestation of audio production from Edward Kelly. Moving on from Fluffy T Bunny, Edward Kelly has decided to get architectural in reference to the meticulous planning of musical information and the near infinite variety of interplay with its inconsistent environment. Lightwell is the space between the abstract and the real, allowing the light to flow from one to the other.